Not usually the most common pain that I see, but a bothersome one just the same. Office workers report this pain the most, but it can be found in any occupation because it’s usually a symptom of improper posture. This pain is centrally located in the thoracic spine between the shoulder blades and a bit farther down the spine. 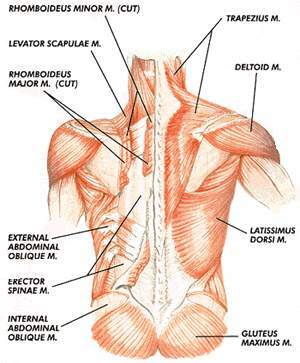 The pain that is felt here is usually due to tightening or stretching in the rhomboid muscles between the shoulder blades, but could also be related to the trapezius, erector spinae or latissimus dorsi muscles. Tuck your chin in and avoid leaning into the monitor. Pull your shoulders back and keep upper back straight and flat. Sit with your back against the backrest. Pull chair in to the desk as far as you can. It’s important here to use your legs to walk your chair in rather than gripping the desk and pulling in with your arms. This will aggravate middle back pain more. Relax shoulders – avoid elevating or “hunching” shoulders. Change position frequently in your chair. It’s beneficial to slouch or lean forward on occasion to loosen cramped muscles and promote blood flow – just remember to come back to proper posture. Adjust backrest height – the lumbar support should rest at the curve of your low back. Adjust backrest tilt – the backrest tilt should be between 90-110˚. Adjust the position of the seat pan – there should be 1” of space between the back of your knees and the seat pan. Bring reading material close to you when reading, e.g. hold paper up instead of leaving it on the desk. Allow some time for these postural changes to alleviate your pain. Your discomfort might even increase at first. This is due to muscles and tendons tightening and loosening to achieve proper posture. Once everything in your body is settled into this new natural position, your pain should subside. Refer back to your postural tips frequently – you don’t want to settle back into bad habits if you can avoid it. This entry was posted in Ergonomics, Health, Productivity, Wellness, Work and tagged middle back pain, office chair, posture, seated trunk rotation, stretching, thoracic spine. Bookmark the permalink.